In Britain, paper printed with patterns has been used for decorating walls since the 16th century. By the late 19th century wallpapers were widely used by all classes, in homes and also in public buildings. 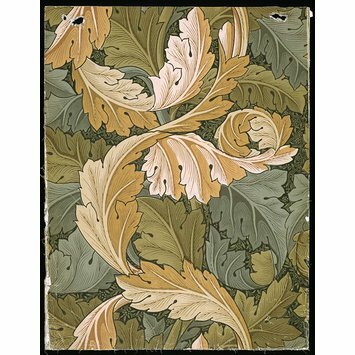 William Morris designed a number of wallpapers all with repeating patterns based on natural forms. This wallpaper was printed for Morris's company by the London firm Jeffrey & Co., who specialised in high quality 'Art' wallpapers. It required thirty wood blocks to print the full repeat, and used fifteen subtly different colours (more than any previous design by Morris). 'Acanthus' was issued in two colour combinations - one in shades of green and the other in predominantly reddish-brown tones. 'Acanthus' is a large-scale repeat which would appear to be most appropriate for large rooms. However Morris believed that a large pattern actually worked well in a small room. He explained that if it was well designed, a large pattern was more restful to look at than a small one. By the 1880s Morris wallpapers had become fashionable. When the wealthy Mander family furnished their newly built house, Wightwick Manor near Wolverhampton, they used Morris wallpapers in 13 of the rooms. 'Acanthus' was hung in one of the bedrooms. 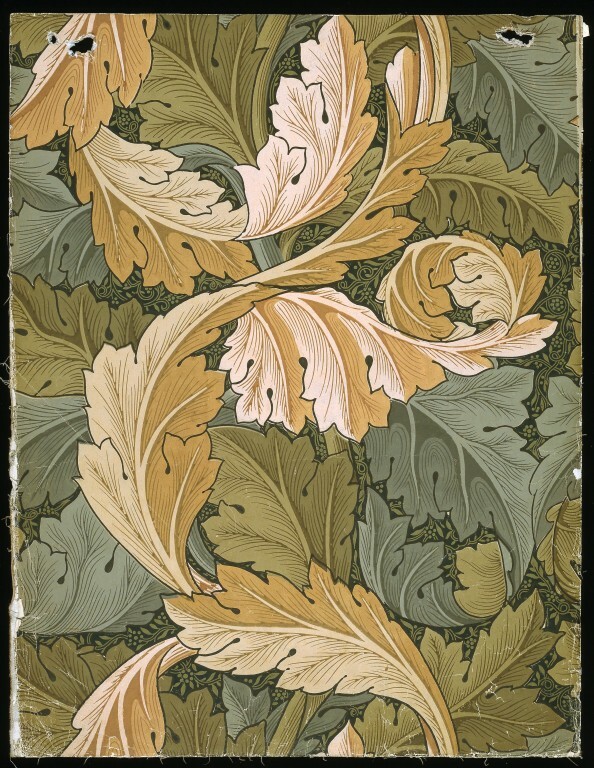 Specimen of 'Acanthus' wallpaper, foliate pattern of intertwined acanthus leaves in shades of green and brown; Block-printed in distemper colours, on paper; William Morris; Part of 'Volume 1', a pattern book containing 25 Morris & Co. patterns from 1862-81 (E.441-529-1919); England; 1875.